Stay one night or more, Save 10%, the more you stay the more you save! Stay n' Save 10% exclusive offer includes: Dine Around Town coupons, Hy-Line Cruises discounts, free morning coffee and pastries, free WiFi access, free parking for registered guests. 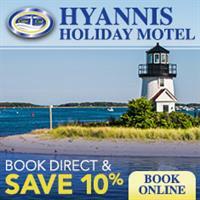 Must book directly on the Hyannis Holiday Motel’s website or call us directly to receive this exclusive offers. Subject to availability, not valid with other discounts, offers or packages. Our offers and rates are subject to change without notice. Offer must be redeemed at time of booking (no exceptions). This Hot Deal is promoted by Greater Hyannis Chamber of Commerce.